Mahomes only could watch. That is the absurdity of the NFL’s overtime rule, that Kansas City’s best player could have no impact on breaking a tie between the Chiefs and the Patriots because of the vagaries of a coin flip. New England correctly called the coin toss, correctly chose to receive the kickoff — remember, this isn’t a given, even with the pluperfect Patriots — and then converted three third-and-longs in a 75-yard drive that ended with Rex Burkhead’s plunge into the end zone for a 37-31 victory and a trip to Atlanta to play the Rams in Super Bowl 53. 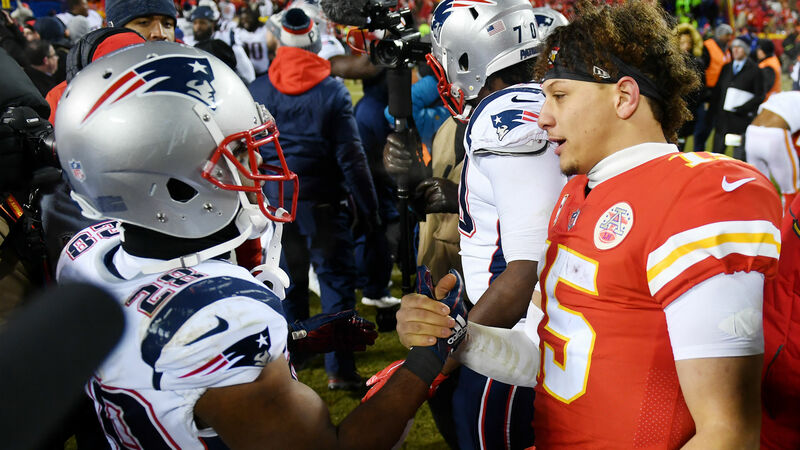 The players who had been the essence of the Chiefs’ success throughout their 12-4 regular season were spectators through all of this. The NFL’s overtime rule calls for a sudden-death victory if the team that possesses the ball first scores a touchdown on that drive. It’s preposterous. In fact, because the Chiefs were the home team — a designation earned by achieving the best regular-season record of any team in the conference — they didn’t even get to call the coin toss. The visiting squad gets that honor, just because. Imagine if baseball were to decide a League Championship Series game that progressed to extra innings by awarding a spot in the World Series to a team that scored a run in the top half of the 10th — without allowing the team in the field a turn at bat. That’s what the NFL just did. The only other sport that decides such a consequential contest by sudden death is the NHL, but even if a team were to win possession at the start of OT and dash immediately to the goal without the opposition ever so much as touching the puck — it’s happened once, maybe twice, in a century of playoff hockey — the winning team needed to prevail in a challenge of skill to gain possession. A face-off is decided by execution, not chance. The response from those who prefer not to consider the logic of how their games function is simple: KC should have stopped the opponent from scoring a touchdown. There is no weight to this argument, because there is no reason to believe if the Patriots defense had been forced onto the field first — a defense that allowed 24 points in the fourth quarter — it would have stopped the Chiefs from scoring a TD. That was a half-measure. It was an improvement. But if one made Robert De Niro the lead of “Chicago Fire,” it’d still be a crummy TV show. It’d just be a crummy TV show with a better star. The rule that allows Tom Brady the opportunity to win the season’s biggest game because his side called “heads” and denies the same to Mahomes is not the worst rule in sports. (By now, you surely know the worst rule in sports is in the NBA; it allows a team that calls timeout late in games to advance the ball 55 feet and make it easier to achieve a game-winning basket). But NFL overtime is a terrible way to decide who goes to the Super Bowl. The solution at this stage of the season has got to be to put 15 minutes on the clock and see which team has more points when that period is done. And if it’s still tied, to do it again. Maybe another 15 minutes, maybe just 10; that could be discussed. But there’s no defense for keeping an offense like the one the 2018 Chiefs deployed from having a say in the team’s destiny.